The wait is over: the Pinch of Nom cookbook is now available! Read on for a delicious, low-calorie and healthy recipe, exclusively from Pinch of Nom. Mix all of the spice mix ingredients together and set aside. Preheat the oven to 200°C (fan l80°C/gas mark 6). Place the peppers and onion on a baking tray. Spray with some low-calorie cooking spray and season with salt and pepper. 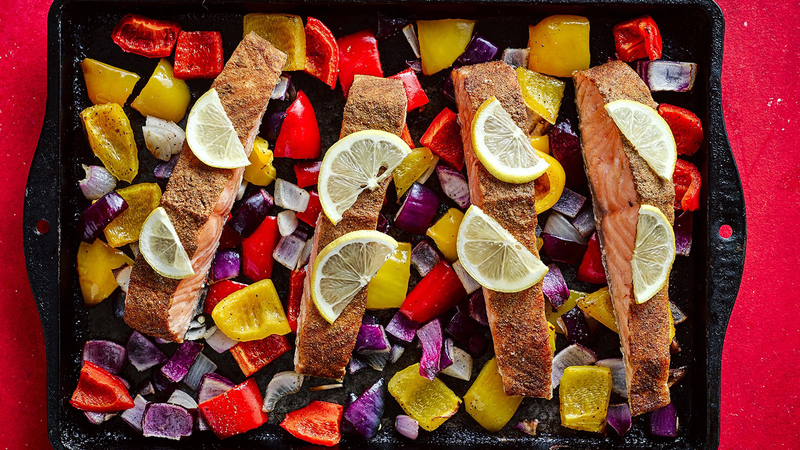 Coat the top of each salmon fillet with the spice mix and place the fillets on top of the veg on the baking tray (you can keep any remaining spice mix in an airtight container for another time). Cut the lemon in half lengthways and cut one half into eight slices. Arrange two slices on each piece of salmon and season with a little salt. Squeeze the remaining lemon half over the fish. Place in the oven and cook for 20 minutes, or until the fish is cooked through. Remove from the oven and serve the spiced fish fillets with the roasted vegetables. The first cookbook from the UK’s most visited food blog is full of delicious, home-cooked recipes which will help you to cook well and lose weight. Full of 100 amazing recipes, all of which are compatible with the principles of the UK’s most popular diet programmes, this book shows that dieting should never be a barrier to good food.